Nine Enviro 400s 1201-9 were originally owned and operated by Weavaway Travel (Newbury & District). 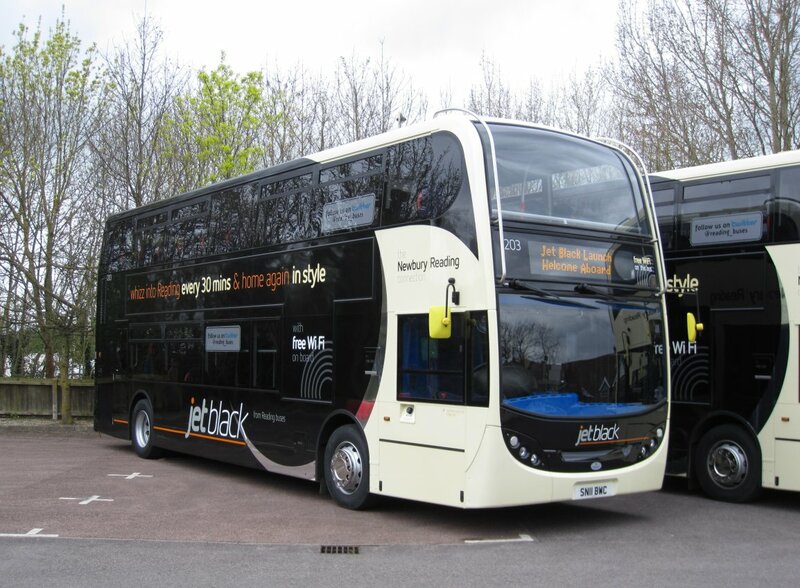 The first six were branded for Reading Buses Jet Black route 1 between Reading and Newbury and operated under contract to Reading Buses, and the last three were Weavaway fleet vehicles (branded Newbury & District Skyrider) that were used on route 1 as spares when required. Consequently all nine were fitted with Reading's real time information and bus stop announcement system, requiring the allocation of fleet numbers 1201-9 from the outset. The vehicles were also fitted with Euro V EEV engines, high back seats, seatbelts and free WiFi. 1207-9 also featured tables. 1209 was repainted into generic silver and had its interior converted to standard specification at Hants & Dorset trim during October, being noted ready to return 14th October 2014 and back at Great Knollys Street by 19th being prepared to return to service. It was noted back in service on 31st October 2014. 1207 was being prepared for repaint into JetBlack livery on 9th November, and departed for Hants & Dorset trim on 11th. It was completed for return on 5th December, and was back in service by 11th. The branding on 1201-3/5-7 was updated in April 2017 to reflect the Kennections style and co-incide with the launch of the JetRed brand for the Newbury - Thatcham routes, with 1204 completed in May. 1203/7 were the first to be done by 14th April. 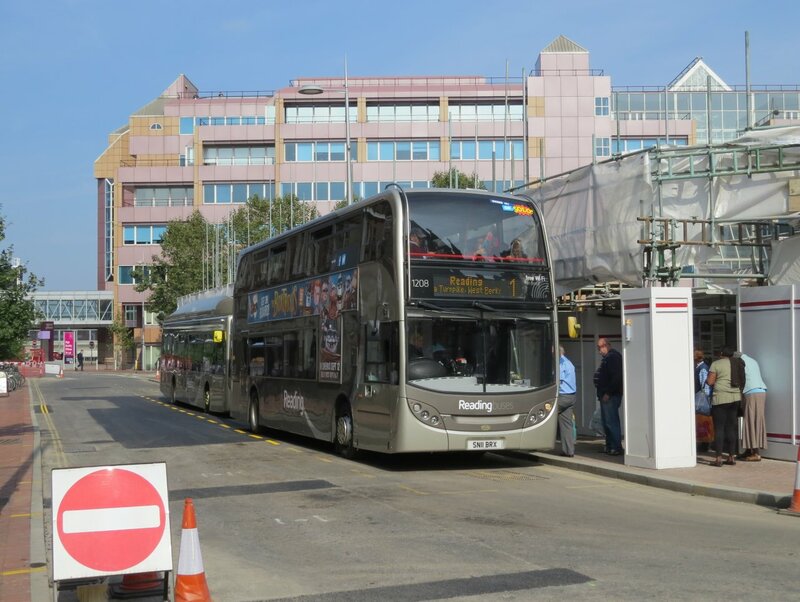 Two further Enviro 400s 1210/11 were purchased from the University of Plymouth in June 2015 to boost the fleet ahead of taking on the operation of First's Reading - Bracknell route 90 from 26 July. They entered service on contracts for Chiltern Edge School which Reading had won a tender to operate from September 2015, but negotiated with the previous operator Weavaway to start early. They ran without assault screens or ticket machines. In late July they departed for Thornton's for repaint and refurbishment with wood effect floors, new black spot moquette, USB charging points and 4G WiFi added. 1210 gained full Lion livery before returning to service on 22nd August 2015, followed by 1211 soon after. A further example was to be purchased from Lloyds Coaches in August 2015 to complete the fleet required for the Reading - Bracknell service. However, in the event Lloyds decided to retain the vehicle. As things transpired from there it was sold to	Go-Goodwins, Eccles along with their second example, and both were acquired by Reading Buses in August 2016 for the new Kennections network in Newbury and allocated fleet numbers 1212 and 1214. 1212 was plain red as a spare for Vodafone and Kennections whilst 1214 entered service on 5 September 2016 in Kennections livery. 1212 had returned from repaint by 2nd October 2016 and in service by 7th. 1208 was repainted into original Reading Buses cream and maroon livery with aquamarine stripe in July 2016 with lettering to celebrate 30 years of deregulation in the bus industry, being displayed at the company's annual open day on 3 July prior to returning to service on 4 July. The livery was modified in July 2017 to Newbury Buses to celebrate 25 years of operations in Newbury. In December 2017 it was repainted into Greenline livery to commence operations on route 702 between Bracknell and London from 27th December 2017, making it's first appearance on a route 702 heritage running day on Sunday 24th December 2017 to bridge the gap between First finishing on 23rd and Reading's operation starting on 27th. 1212 was repainted into Vamooz livery in July 2017, ahead of the launch with partner Transdev Blazefield on 26th. It went away for repaint into Greenline livery on 31st Mat, returning on 4th June and returning to service on 5th. 1214 was repainted into Greenline livery after service on 14th May, returning to service on 7th June.